A dog lover may view the fierce reputation of the American Pit Bull Terrier (APBT), with a good deal of skepticism. Having a love of the canine world can either cloud your judgement or allow you to be better educated. There was a time when the thought of Pit Bulls nanny dogs were commonplace in many homes around the world. Many a dog owner will believe that the behavior of a dog is often down to the training from its owner. But, is a dog's behavior also effected by his genetics? Are there dogs that are predisposed to aggressive behavior or dogs that do not do well around children because of their DNA? Do you think that Pit Bulls fall into this overly aggressive category? Now, let's take the view of a none dog lover. You may feel ever more anxious at the thought of a Pit Bull dog, along with children, in the same room together. A good deal of that anxiety could be due to constant media hype. As with all stories, the media tends to focus on the horror stories. They typically choose to show the stories portraying that this particular dog is not a breed we can trust. The media has helped to create a frenzy of fear around the Pit Bull dog. The Pit Bull owes its ancestry to a dog breed based in the UK, the Staffordshire Bull Terrier (Staffie). Although the Pit Bull is larger and more bulkier than a Staffie, they do look similar. The Staffie came about, as a result of breeding an Old English Terrier with A Bull Dog. The APBT, was bred to be powerful and athletic. As with the Staffie, these dogs made for good bloodsports – used in bull baiting, bear baiting and pit dog fighting. Other uses, in the past, have been as working dogs for driving livestock and as family pets. Despite bloodsports being illegal in the USA, some Pit Bulls are still bred for their fighting abilities. Even today, this breed will take part in clandestine dog fights. In spite of these fearsome characteristics, the Pit Bulls nanny dogs also gained recognition. Considering the Pit Bull is a descendant of a dog that was mainly bred to fight, how exactly did it get the reputation as a Nanny Dog? Some believe Pit Bulls nanny dogs earned this title due to many photos from the 19th century that have come to light. They depict the Pit Bull dog, posing alongside family members and children. It seems that our great grand parents had no problem with Pit Bulls around their kids. They also gain the reputation of nanny dog based on their positive characteristics. This is a breed known to be strong, but also loyal and devoted to their family. Their loyalty to the pack makes them protective of young children. Some negative opinions may be due to the Pit Bull breed bias as well as the fact that Pit Bulls are often viewed as muscle-heavy aggressive dogs. Furthermore, some blame can be placed on the media, which often paints this breed in a negative light. It is a common belief that Pit Bulls are inherently aggressive and violent dogs. In general, most people believe them to be dangerous dogs, even when there are breeds that are genetically far more aggressive and “more dangerous” than Pit Bulls based on incidences of dog bites (such as Rottweilers, for example). Pit Bulls often attract the worst kind of dog owners… People who are only interested in these dogs, for fighting or protection. They are so often used as a status symbol, and even to intimidate rival gangs. Their use in bloodsports, such as dog fighting, continues today. These dogs are often trained to be purposefully aggressive and hostile, to other people. 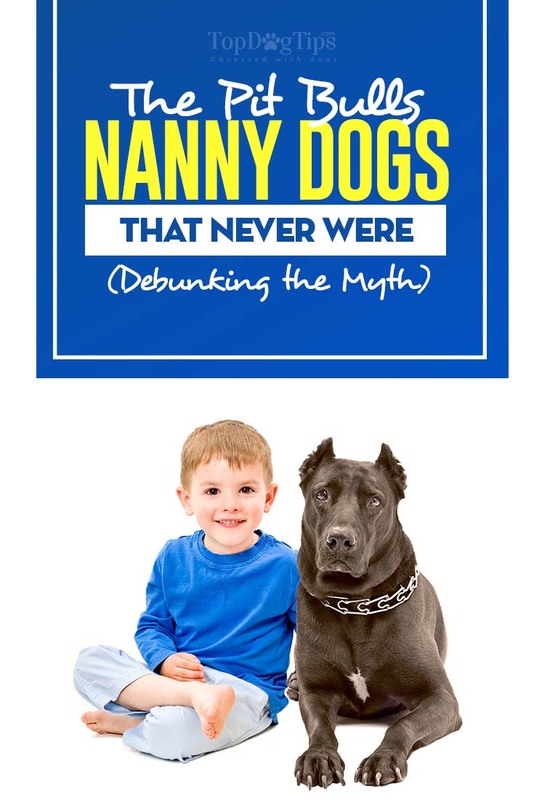 There are studies that support this evidence, and of course these are not the dogs that grow to be Pit Bulls nanny dogs. In 2009, the Journal of Forensic Science gave us some interesting results from their studies. They showed that owners of potentially vicious dogs were more likely to be criminally active than other dog owners. This was not a surprise to most. These beliefs are so popular, that legislation in the UK, The Dangerous Dogs Act, has made it illegal to own one. Yet, despite this bias, Pit Bulls are still owned by millions of American families. Including families with children, and many have no problems at all. To understand the behavior of Pit Bulls nanny dogs, is much the same as with any breed dog. A dog is a domesticated descendant of a wild animal, a shared common ancestor to the wolf. Although this was around 34,000 years ago, a dog still has many innate deep routed instincts. ALL dogs are natural pack animals. Pit Bulls are powerful in stature and strength, and a single dog could soon overcome a full grown adult, let alone a small child. Sometimes spaying or neutering a dog, can help reduce its levels of aggression. In all fairness, if you have a dog that shows aggression to people, then they are not the ideal family pet. This is most especially true if children are present in your home. There is no denying that Pit Bulls are responsible for many attacks on people, some even fatal. The website DogsBite.org claims to be a public education website. They collect statistics on fatal dog attacks from news reports. In the US, in 2016, the last year of completed records, there were 31 fatal attacks by dogs. 22 of those attacks, or 71%, were by Pit Bulls. Between the period 2005 and 2016, Pit Bulls were responsible for killing 254 people in the US. Some argue that these statistics are unreliable. More so, the means of recording the dogs responsible for the attacks are not reliable. Other sources argue that fatalities by Pit Bulls are the result of poor breeding, bad training and un-socialized males. They say that many aggressive Pit Bull dogs, are often owned by irresponsible owners. Whatever the true statistics are, they make frightening reading. Such reports make every parent wary about this powerful breed. Statistics like these do show how dangerous a powerful dog can be in the wrong hands. Irrespective of these statistics and their reliability, you should NEVER leave a child unattended with any dog, in the same room. Dog behavior can be very unpredictable, no matter the breed or nature of the animal. We've previously looked at the science behind dog aggression. Studies are very clear on the subject. If a dog feels threatened or uncomfortable, its animalistic instincts for survival will kick in. That could mean it will attack any who stand in its way. The belief that a dog can attack without warning, is perhaps misleading. There is always some sort of sign. Growling, especially baring its teeth, hackles raised, and other signs. An experience dog owner will understand such body language, before the dog attacks. This, of course is no consolation. An infant who is left alone with a dog, would never understand such a threat. Plus, a small child is unlikely to be able to escape anyway. No two dogs are the alike, as no two humans are the same. Dogs, as with humans, have characters with innate feelings. A healthy dog is one that has a good balance of discipline, exercise, food and love. Also, as with humans, dogs prefer routine in their lives. Whilst it may seem obvious, bear in mind that dogs are animals. All too many dog owners, treat them as if they were human. This is wrong, and will only serve to cause confusion for the dog. A dog is a pack animal and does need to know where it stands in the pack. This ensures that it feels a part of the pack and knows its place. With the balance we mentioned, a dog should remain calm and happy. Never though, will it lose its instinctual behavior, should it feel threatened. So, back to the original question, are Pit Bulls nanny dogs a reality? The simple answer to that is a definitive NO. In all fairness to the Pit Bull breed, no dog is suitable as a nanny dog. Any animal can behave unpredictably. Especially if it feels threatened. What threatens a dog is not something a human would understand. It is a testament to the breed though, that many families own Pit Bulls without any problems whatsoever. This shows that it can be a good companion dog. If you do keep a dog as pet, never ever leave it unattended with children around. Pit Bulls may not be nanny dogs as the popular myth may lead you to believe, but they're a breed like any other. Proper socialization, care and training is what makes a good dog. Commode huggers association, I am renewing my membership after reading this piece. Man, this writer doesn’t have a clue.